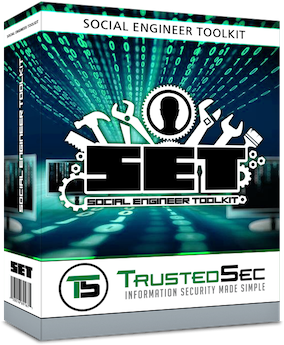 The Social-Engineer Toolkit (SET) was created and written by the founder of TrustedSec. It is an open-source Python-driven tool aimed at penetration testing around Social-Engineering. It has been presented at large-scale conferences including Blackhat, DerbyCon, Defcon, and ShmooCon. With over two million downloads, it is the standard for social-engineering penetration tests and supported heavily within the security community. It has over 2 million downloads and is aimed at leveraging advanced technological attacks in a social-engineering type environment. TrustedSec believes that social-engineering is one of the hardest attacks to protect against and now one of the most prevalent. The toolkit has been featured in a number of books including the number one best seller in security books for 12 months since its release, “Metasploit: The Penetrations Tester’s Guide” written by TrustedSec’s founder as well as Devon Kearns, Jim O’Gorman, and Mati Aharoni.